My daughter prepares healthy foods for me to take to work so that I am not tempted to grab junk food. Every week my daughter prepares lunches for me to take to work. Tonight she is making humus wraps for me. She is using Romaine lettuce for a wrap. If it was a tortilla it would problem have gluten, prepared with the lettuce as the wrap they are gluten-free. She says gluten is not good for people who are pre-diabetic. She says that gluten affects brain chemicals. And that their can be a tie in depress. Gluten affects the gut and that’s where all the hormones are made. That can affect your mood and how you feel. Everything in the wrap she is prepping is an anti-oxidant. Anti-oxidants are important because they help rid your body of free radicals which can damage cells. And anti oxidants help cleans the body of toxins. Free radical damage can cause cancer. Well, here it is Nov. 2014! My husband and I are doing very well. 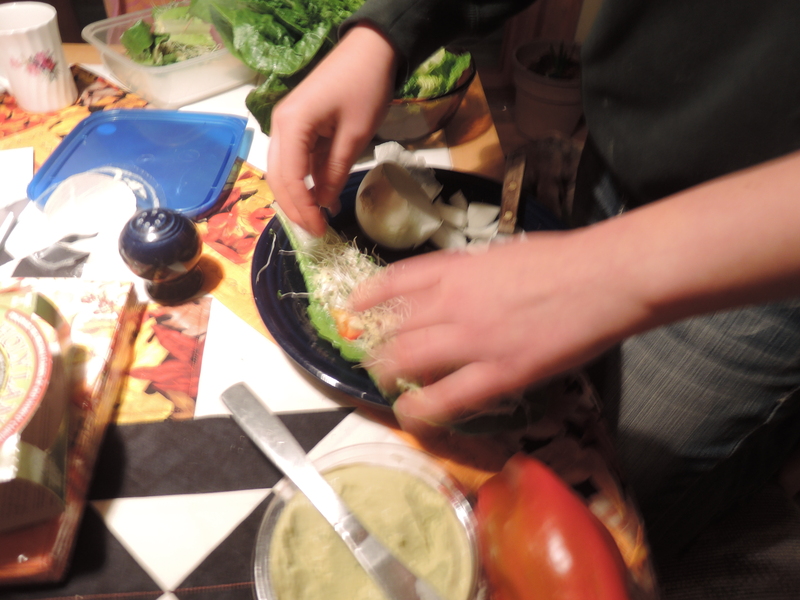 In 2008 I was doing most of the cooking to make sure we were eating healthy food. Food good for our brains. Now, he is doing most of the cooking for me. He doesn’t pay much attention to whether or not the food is organic, but he does include lots of vegetables. We went a couple years without really taking any drugs. But recently we had some changes. He got a new job … so I was careful to give us both vitamins, natural sleeping aids and very small dosages of Lithium. You can purchase small does of Lithium over-the-counter. I think we are home free now, as far as staying stable, but I wanted to make sure the changes didn’t upset our stability.